The impact of globalization in every field of knowledge has been increasing over the past years. In higher education for example, there is a need to promote –especially in undergraduate students, different skills so that the graduates are able to adapt to the turbulent and complex professional world they will need to face. One of the most important skills in the contemporary world is creative thinking, or “thinking outside the box.” In the fields that I am very familiar with (i.e. engineering and business) I will argue that the most important skill someone can have is the ability to effectively solve problems in collaboration with other people in an innovative way. Research has demonstrated that one of the most effective ways to increase innovation is the exposure that diversity brings. Interacting and working with people with different perspectives, can help students to see the world different. I believe that it is extensive to the exposure to diverse role models. That is one of the reasons why I believe international students and faculty members have a positive impact on the dynamics of higher education. 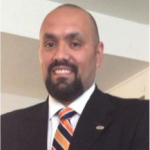 However, being an international student or faculty member is not easy. There are several challenges that people may face when they are in international academic environments. In some cases it’s the language, in other cases it’s about cultural differences, or even in some cases is about missing their roots. My interest during the Global Perspective Program 2015 was focused in understanding the support systems that international students and international faculty members have in Switzerland and Italy, and being able to compare those experiences with the U.S. and South America since I’m familiar with both. Support systems can be considered as formal institutionalized structures created with the goal of minimizing the issues that different individuals can face regarding certain things. They also serve as ways to help people’s transition into new situations. In this paper I will present my understanding of how the support systems work in Switzerland and Italy based on what I was able to observe in the different sites I visited, as well as, the information I collected by asking different actors (i.e. professors, graduate students, and administrators) and the information available online. First, I would like to start by providing some numbers regarding the proportion of international students in some of the institutions that I visited. For example, at Swiss Federal Institute of Technology in Zurich (ETHZ) and Università della Svizzera italiana (USI) around 70% of their faculty members are international, same case for the University of Basel (65%), and the University of Zurich (there are no exact percentages available but I was told the number was also high). It is important to keep in mind that Switzerland is in a short driving distance from at least 3 different countries in Europe, and that people in the European Union (EU) is able to work in Switzerland without having much trouble. Nevertheless the number is really high when compared to the United States (around 10%), or even in South America where can be less than 1% in most of the countries. To illustrate that, I have worked in Universities in Argentina and Colombia for example where I was the only international, and in the institutions I worked in Venezuela there were no international faculty members. This proportion also changes when we talk about undergraduate students. In Switzerland the number of international students is around 20% in average. It can be even lower in Italy, for example at the Politecnico di Milano, the number is less than 10%. The numbers are still considerable when compared to my current institution (Virginia Tech) where the number of undergraduate international students is 3.8%. There are several ways that institutions can support international students and faculty members. In my search I found that some institutions have formal systems, and other have what I called indirect or secondary systems. Some of the formal systems that I found were the welcome center at the University of Zurich, and the University of Basel. According to their websites, these centers provide support regarding housing, immigration, and language. The University of Applied Sciences and Arts of Southern Switzerland (SUPSI) also has an international office. One interesting thing about the formal systems is that when I asked international graduate students, they were not aware that those systems existed at the institutions. Some students mentioned it was because of lack of information about the services during orientation. Indirect support systems are systems that are embedded in other institutional structures that were not created to provide support but they do it anyway. For example, at ETHZ the Human Resources department provides information regarding visas, moving, mentors, and dual careers, for international faculty members and students. Another indirect support system is the International Center at University of Zurich, and the International Office at University of Basel, departments created to deal with international collaboration but can also provide support for international students and faculty members. In addition, at SUPSI free intensive Italian courses are offered to international students and faculty members. Finally, another indirect support system in place in different institutions was regarding their mission and values. For example, at the University of Zurich one of their goals is to “Recruit outstanding researchers from throughout the world, foster international collaboration, and student abroad programs,” or ETHZ that claims that they recruit “the best professors from all over the world.” Additionally, one of SUPSI institutional core values is “Internationality.” By including these statements in their mission, vision and values, indirectly the institution is supporting international faculty members and students. When compared to the U.S. there seems to be considerable less support system in Switzerland and Italy. In U.S. universities there are several offices that will deal with providing all different types of support for international students and faculty members with regards to visa and immigration processes, adaptation to the U.S. culture, language barriers (like writing centers), provide community support, and help them navigate the higher education system in the country. Despite all the support systems, the number of faculty members and students in the U.S. is considerable low, it seems like institutions in Switzerland and Italy are more aware of the importance of recruiting and retaining international faculty members and students. 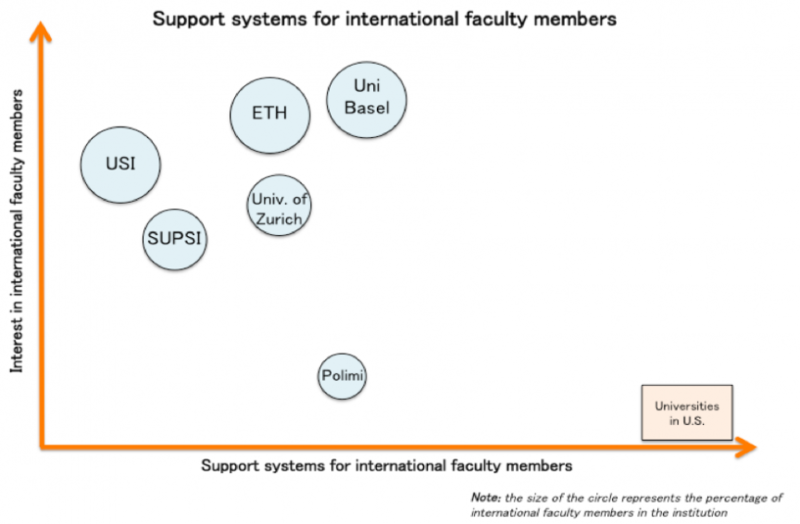 To summarize my perceptions, I created Figure 1 that provide visual representation of two different things: the interest in international faculty members and students in one side, and the availability of support systems in the other side. It is important to notice that the size of the circle represents the percentage of international faculty members and students in the institution. It is also possible to compare the institutions to the U.S. In conclusion, it seems that where there are a lot of support systems in place, there is a lack of interest in bring the diversification that international perceptions can provide. For example, in U.S. higher education institutions, there are several initiatives to increase diversity in the classrooms. These inclusive initiatives are not only for U.S. citizens but also for international students. Therefore, by having a focus on supporting members from different populations, the entire higher education system is prepared to deal with international students and faculty members at any level. In Europe, on the other hand, there are several differences regarding support systems. There are countries where it is very difficult to even find information on the things that someone might need if they decide to study or work abroad. I believe is important to have formal support systems in place in every higher education institution around the world. In the next decades we as a globe will be dealing with issues that will affect us despite the country and the continent we are in, making international collaboration, especially in research a need. If we are able to develop truly global research projects, the different perspectives coming from all over the world will allow us to make better decisions, to promote more creative solutions that can help to the majority, rather than a specific group of people.